❖ When witnessing a signature, a Notary certifies that the signer personally appeared, was positively identified, and that the Notary witnessed the signing of the document on the date of notarization. ✓ The act of witnessing a signature differs from an acknowledgement in that the party relying on the document may know for certain that the document was signed on the same date that the Notary affixed the official seal and signature to the document. ✓ The act of witnessing a signature differs from a jurat in that the signer is merely signing the document, not swearing or affirming that the contents of the document are true. 1. The signer personally appears before the Notary. 2. The Notary scans the document to make sure there are no blank spaces. 3. The Notary positively identifies the custodian. 4. The Notary asks the signer to sign the document in his or her presence. 5. The Notary completes certificate wording for a signature witnessing and affixes the official signature and seal. ❖ A certified copy is a notarial act in which a Notary certifies that a photocopy of an original document is a complete and true reproduction of the original document. • Vital Records, such as birth or death certificates. • Recordable Documents, such as deeds. 1. The document custodian personally appears before the Notary. 2. The Notary positively identifies the custodian. The Notary makes the photocopy. 3. The Notary completes certificate wording for a copy certification and affixes the official signature and seal. 4.The Notary affixes the certificate to the first page of the copy. ❖ A notarial act in which a Notary certifies having witnessed the signing of a document by a signer who swears or affirms that the document is truthful; also called verification upon oath or affirmation. ‣ Jurat certificates are executed on documents called “verifications.” A common type of verification is the affidavit. ❖ An affidavit is a written statement signed before a Notary or other authorized officer by a person who swears or affirms that the statement is true. ❖ A deposition is a signed transcript of the signer’s oral statements taken down for use in a judicial proceeding. 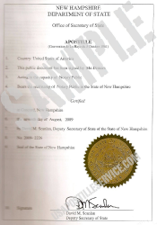 ✓ New Hampshire Notaries and certain other officers are authorized to administer oaths and affirmations. 3. The Notary positively identifies the signer. 5.The Notary completes certificate wording for a jurat and affixes the official signature and seal. ❖ An acknowledgement is a notarial act in which a Notary certifies having positively identified a document signer who personally appeared and who admitted having signed the document freely. 4. The Notary asks the signer to acknowledge executing the document and sign the document if it has not been signed. 5. The Notary completes certificate wording for an acknowledgement and affixes the official signature and seal.